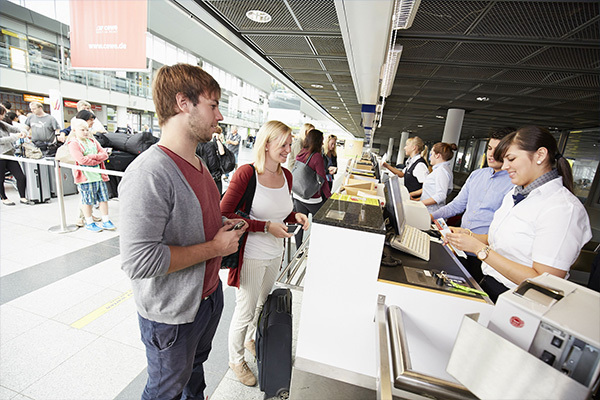 The check-in desk for your flight will open 2 hours before the scheduled departure time. You should arrive at your airline's check-in desk between one-and-a-half and two hours before your flight is scheduled to depart to make sure that you have plenty of time to check in and that the flight leaves on schedule. If you arrive later than this, the airline can refuse to allow you on board. Please contact your airline or tour operator to find out when the check-in desk for your flight closes. You should be at the gate at least 40 minutes before your flight departs. In order to ensure that everything keeps running smoothly and even more quickly in the future, please be aware of which checkpoint you are supposed to go to for security control. Information about the checkpoints you are supposed to go to can be found on the departures page of the Dortmund Airport website. Our friendly ground staff will of course be happy to help if you have any further questions. You will find the check-in desk here: The Finding your Way Around the Airport page will give you an overview. 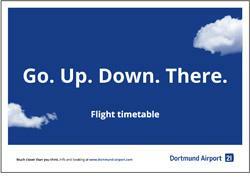 All airlines, all destinations – the PDF flight plan shows all flight connections at the Dortmund Airport clearly. For simple download or print out and take along.